Ridgemont Highlands’ outstanding stallion Dynasty looks to have another high class crop of 3yos to his name. This crop includes such highly rated sorts as Majestic Mozart, Bunker Hunt, unbeaten filly Front And Centre, KZN Guineas Trial runner up Thanksgiving, the eye catching Knights Templar, and the very exciting colt Belgarion. The latter made it two wins from as many outings when scoring an emphatic victory at Kenilworth on Saturday. Bred by Alec Foster, Belgarion powered home from off the pace to score an emphatic two and three quarter length victory in a MR 71 handicap over 1600m for trainer Justin Snaith and jockey Richard Fourie. The colt, a full-brother to the useful Qing, had previously shone when making a winning debut over 1200m and he looks to have a bright future ahead of him. Dynasty also made headlines earlier in the week when his champion daughter Lady In Black accounted for last season’s Horse Of The Year and G1 Sun Met heroine Oh Susanna in a pinnacle stakes over 1600m. 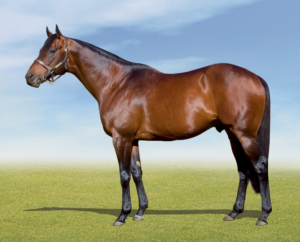 Bred by Willem Engelbrecht Jr, the Dennis Drier trained four-year-old showed her class in recording a three parts of a length win over a field which included not only Oh Susanna, but Dynasty’s graded stakes winner Hashtagyolo, multiple feature race winner Brave Move and the Diana Stakes winners Love To Boogie and Goodtime Gal. South Africa’s Equus Champion 2YO Filly of 2016-2017, Lady In Black has now won five of ten outings, with her previous victories including the 2017 G1 Thekwini Stakes and 2018 G3 Umzimkhulu Stakes. Her four times Equus Outstanding Stallion sire Dynasty has a single lot on offer at this week’s CTS Ready To Run Sale –a colt (Lot 70) out of the Rich Man Gold sired Ladies Mile winner Even Money. (This colt is bred on the same Dynasty/Rich Man’s Gold cross as Hong Kong G3 winner Nassa).